It provide best engineering solution , which meet the conflicting requirements of Operational capacity, Safety & cost. 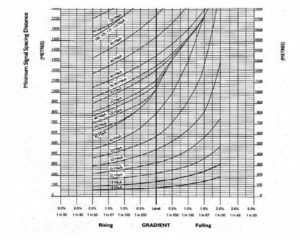 * HEADWAY IS A MEASURE OF HOW FREQUENTLY TRAINS CAN RUN. 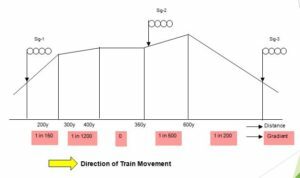 * ‘HEADWAY TIME’ (HT) IS THE TIME TAKEN BY THE FOLLOWING TRAIN TO PASS PAST A GIVEN POINT ON TRACK AT FULL SPEED AFTER THE PREVIOUS TRAIN HAS PASSED IT, SUBJECT TO THE MINIMUM SEPARATION PERMITTED BY THE SIGNALLING SYSTEM. * ‘HEADWAY DISTANCE’ (HD) IS THE DISTANCE BETWEEN TWO SUCCESSIVE TRAINS PASSING THE SAME POINT WITH THE FOLLOWING TRAIN AT FULL SPEED, SUBJECT TO THE MAXIMUM FREQUENCY PERMITTED BY THE SIGNALLING SYSTEM. 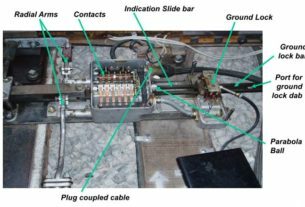 uTHE PURPOSE OF HEADWAY CALCULATION IS TO DETERMINE WHAT TYPE OF SIGNALLING, WITH WHAT SIGNAL SEPARATION, IS REQUIRED TO MEET THE CUSTOMER’S SPECIFICATION IN THE MOST COST-EFFECTIVE MANNER. 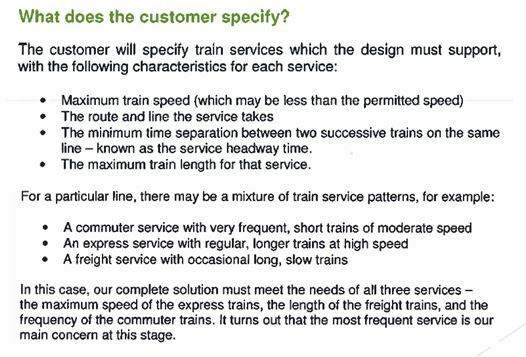 1.DECIDE THE MOST INTENSIVE TRAIN SERVICE WHICH DICTATES THE ‘HEADWAY CALCULATION’ FOR EACH LINE. 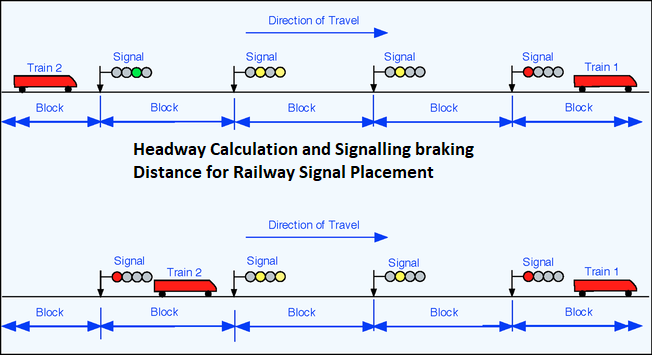 BASED ON THIS CALCULATION OF ‘N’ AND A POSSIBLE ‘SIGNAL SEPARATION RANGE’, SELECT THE TYPE OF SIGNALLING SYSTEM TO BE PROVIDED. AS ‘D4’ IN 4 ASPECT SIGNAL TERRITORIES. 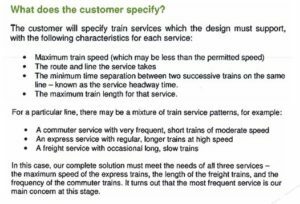 (3) TRAIN SERVICE SPEED (V) IN METERS PER SECOND (m/s) TO BE CONVERTED FROM MILES PER HOUR (M/H) AS GIVEN. * REQUIRED SPACE BETWEEN SIGNALS IS CALCULATED BY FORMULA: D = V * HT (SPEED x TIME) MAXIMUM SPEED AND HEADWAY TIME, BOTH ARE SPECIFIED BY THE CLIENT AS REQUIRED. ASPECT (‘YELLOW’ OR ‘DOUBLE YELLOW’ IF USED). 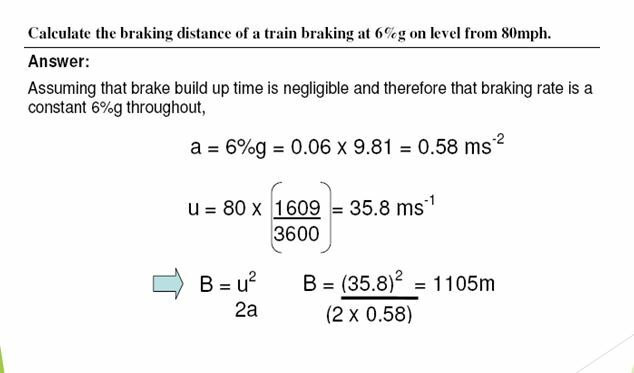 * THIS DEPENDS ON THE TRAIN BRAKING CAPACITY, ‘a’ IN UNITS OF: ‘m per Sec per Sec’(m/s2). 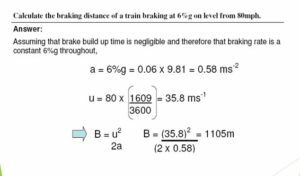 SBD, S = U2/2a, WHERE ‘U’ IS THE MAXIMUM TRAIN SPEED & ‘a’, THE TRAIN BRAKING CAPACITY. 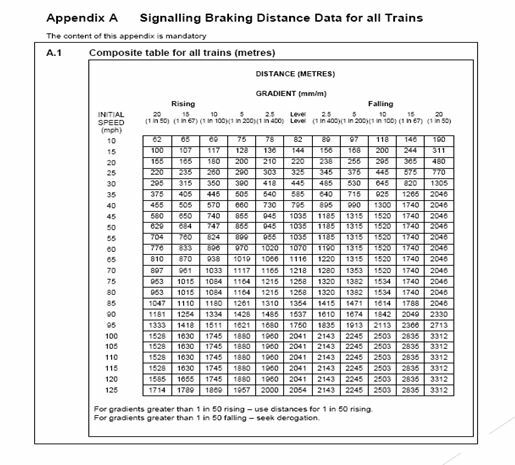 (Signal Braking Distance (S) is directly proportional to the required maximum train speed and inversely proportional to the available train braking capacity both given by the client). (a) first, convert speed units from MPH to ‘m/s’. 100MPH = 100 x (1609/3600) = 44.7 m/s. 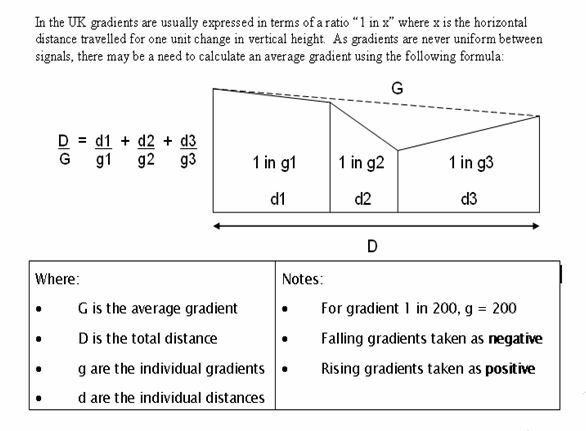 (b) then, S = (44.7)2 /2a = (44.7)2 / 2 x 0.5 = 1998m. 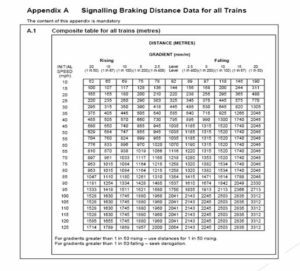 * ‘SBD’ IS ALSO CALCULATED FROM THE AVAILABLE DATA INCLUDING THE ‘TRAIN BRAKING CAPABILITY’ TO DECIDE THE MAXIMUM SPACE THAT CAN BE CONSIDERED TO BE KEPT BETWEEN THE ‘FIRST CAUTION’ AND ‘RED’ ASPECT SIGNALS TO BE FACED IN SUCCESSION. 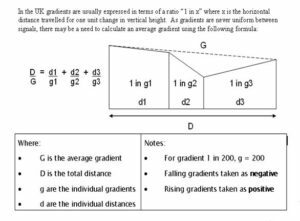 * ‘SIGHTING DISTANCE’ IS SOMETIMES REFERRED AS THE DISTANCE BETWEEN THE EARLIEST POINT ON APPROACH AT WHICH THE SIGNAL IS SIGHTED FIRST AND THE SIGNAL. * BUT AT MOST OF THE TIMES, IT IS TAKEN AS ‘THE LAST PERIOD OF UNINTERRUPTED VISION’ ON FINAL APPROACH TO THE SIGNAL, WHICH SEEMS MORE ACCURATE. * ‘READING DISTANCE’ IS RECOGNIZED WITHOUT THIS AMBIGUITY AS THE LATTER DEFINED SIGHTING DISTANCE WHICH IS CONTINUOUS FOR A STIPULATED PERIOD. * THIS FINAL CONTINUOUS MINIMUM VISIBILITY ENSURES THAT THE DRIVER IS ABLE TO REACT TO A LESS PERMISSIVE / MORE RESTRICTIVE ASPECT OBSERVED BY APPLYING BRAKES WITHOUT LOSING MUCH TIME (REACTION DISTANCE INCLUDED). * A SIGNAL MAY BE VISIBLE FROM A LONG DISTANCE ON THE APPROACH. 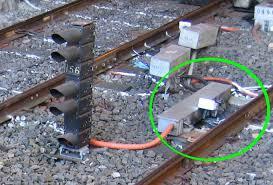 BRAKING (EVEN FOR A WORST CASE TRAIN) ONLY NEEDS TO START AT THE POST OF FIRST ‘CAUTION’ SIGNAL. 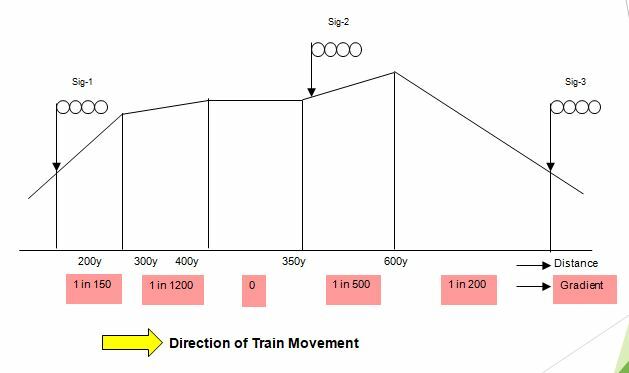 * IF A TRAIN IS RUNNING TO THE LINE CAPACITY LIMIT, AN INITIAL CAUTION SIGNAL ASPECT MAY BE OBSERVED TO ‘STEP UP’ TO GREEN DUE TO THE EARLIR TRAIN CLEARING ITS SECTION AND MOVING AHEAD BEFORE THE MINIMUM 8 SECONDS HAVE LAPSED. 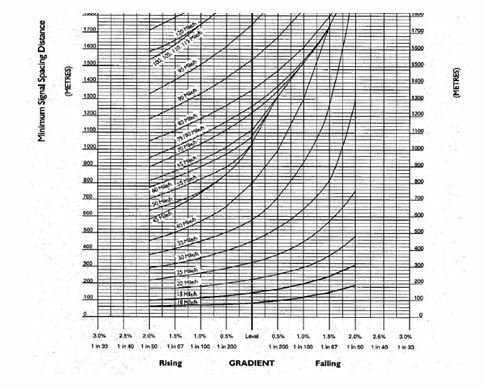 * A MORE PRACTICAL DEFINITION OF READING DISTANCE, A MINIMUM OF 10 SECONDS READING TIME IS CONSIDERED JUSTIFIABLE IN PRACTICE FOR HEADWAY CALCULATION. 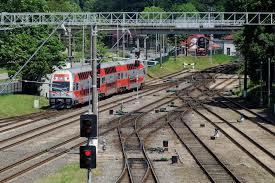 * AS SIGNALS ARE PROVIDED WITH ‘AWS’, THE READING DISTANCE MAY ALSO BE SUCH AS TO FACILITATE THE STEP UP OF SIGNAL ASPECT TO GREEN BEFORE THE TRAIN COMING OVER THE AWS TRACK MAGNET, FOR THE DRIVER TO HEAR ‘SIGNAL GREEN’ WARNING BELL. 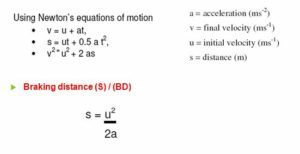 * A READING DISTANCE OF 300m IS PRACTICALLY CONSIDERED FOR HEADWAY CALCULATIONS AS IT IS CONSIDERED REALISTIC FOR A SPEED RANGE OF ABOUT 70 MPH (113 kmph).